This week, North Carolina’s Electric Cooperatives hosted 50 high school seniors from the Athens Drive High School STEM Academy in Wake County. The students visited the statewide office for an on-site educational experience. Students from Athens Drive High School STEM Academy interact with energy services specialist Rick Schroeder as he explains the House of Pressure. 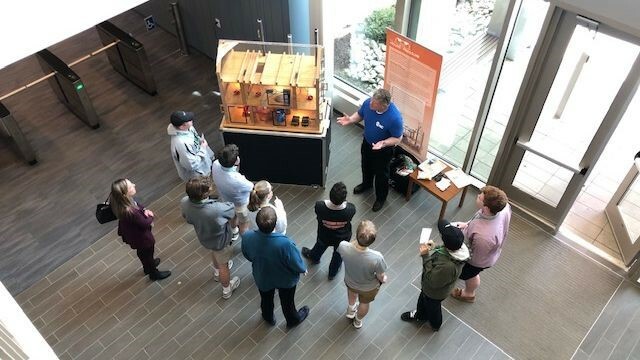 Students broke into five groups to visit demonstrations around the building to learn about technology concepts applied at electric co-ops: the PV solar array, the “House of Pressure” demonstration, electric vehicle charging stations, the energy operations center and a microgrid demonstration. North Carolina’s Electric Cooperatives began a partnership with the school in fall 2018 as a long-term workforce development initiative to build student awareness of career opportunities in the energy industry and at electric co-ops. Employees of North Carolina’s Electric Cooperatives have also visited classrooms to discuss power supply and provide an overview of electric cooperatives and their work throughout the state.